As a result of this honor, both schools will receive a $500 player health and safety grant from the Hunt Family Foundation. Each school will also receive a Gatorade Sideline Kit, including coolers, bottles and Gatorade products. 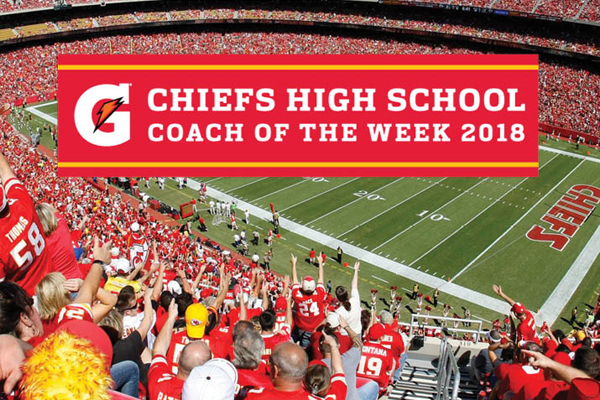 Additionally, all coaches will be presented congratulatory footballs autographed by Chiefs Head Coach Andy Reid and certificate recognizing their selection. Both coaches are now qualified for the Eric Driskell Coach of the Year Award, which will be voted on later this fall. The Eric Driskell Coach of the Year Award is selected by a panel comprised of the Missouri and Kansas Boards from the Greater Kansas City Football Coaches Association. One winner will be selected from the pool of weekly winners, whereas previously one winner was chosen for each of Missouri and Kansas. Lee’s Summit North is off to a 3-0 start this season. Last week the Broncos beat power Blue Springs for the first time in school history 28-27 in overtime. This was the first win in 21 tries dating back to 1999. Mozee said he and his staff was honored to earn the award. Olathe South is off to a 2-0 start with easy wins over Lawrence and Olathe Northwest. The Falcons have outscored their opponents 61-17 in their two wins this season. Lewis was thrilled for his program to receive the honor.